I often want a camera tripod to make travel videos however, it is not possible to carry one because of size and weight in my backpack. I have made 297 "Travel Videos" and published on YouTube.com. And, if I had a person to hold the camera, I would make from 1-3 videos per day, using myself as the interviewer. I need to give up on finding a camera person. In my opinion, the best videos are when I introduce the video, set it up, explain what is going to happen, then walk the viewers through the video. This is rather easy to accomplish when there is a person who can hold a camera steady, then will hand the camera to me without talking or making a fuss. I must accept, that finding a person to hold the camera is close to impossible, generally they cannot see, talk too much, get too nervous, there are so many problems it is daunting. I must give up on the idea of using humans, and move on to camera tri-pods. 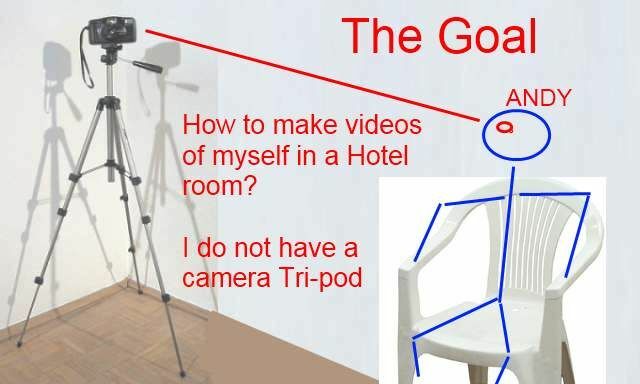 List of things to use as a camera stand or tri-pod in a Hotel Room.